He was given Calpol, but this didn’t calm him! The following day he was taken to his GP who told us to take him to A&E – according to his symptoms it was possible he had septic arthritis. He was checked over at the local hospital and told he just had growing pains. I was relieved and didn’t think anything more of his leg pains, giving him ibuprofen when it happened again. He was reluctant to walk a lot and we started using his pushchair most times we went out. He still complained about his legs and was out of breath quite easily. His personality changed quite a bit. He had been such a happy, chilled-out little boy, and suddenly he was quite a handful! We thought the Terrible Twos had arrived a year late! He was sent home from nursery one day with a temperature, so we took him to the GP. Again, we were told to take him to A&E since the GP couldn’t find any cause for his fever. We were sent home from hospital again, being told Benji had tonsillitis. He was given antibiotics and he seemed to get better over the next days. However, by the end of that week he was inconsolable during the night; again his legs were hurting and again he had fever! We went to Sheffield Children’s Hospital where I was adamant we wouldn’t leave until we got to the bottom of what was causing Benji so much discomfort! Benji was examined by a lovely doctor in A&E who found a single tiny spot on his side and suspected he could have meningitis. Because of this, he had some blood tests. After a long wait, a doctor came to tell us that Benji was anaemic and that we were to be seen by a haematologist. We were taken to a private room – I knew it was something serious if we weren’t being seen at the bedside. The haematologist told us that she had looked at Benji’s blood and suspected he had leukaemia. At this moment, my whole world fell apart! Hearing ‘leukaemia’ felt so surreal. The doctor was so calm, however, and very comforting. She explained that Benji was to be taken to the oncology ward where he would have more tests. We had to wait until the Monday until his diagnosis could be confirmed following a bone marrow aspirate. His consultant was already certain it was leukaemia so decided to start his treatment on the Monday morning by giving him chemotherapy during a lumbar puncture. 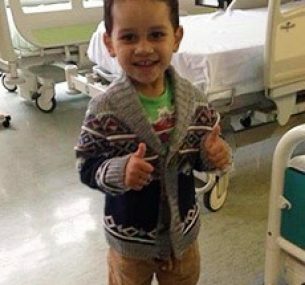 On Monday evening, it was confirmed that Benji had leukaemia. We were told he had Acute Lymphoblastic Leukaemia (ALL) and told what would happen to Benji from then on. 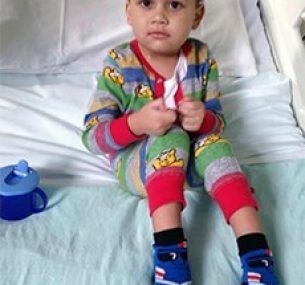 Because of his age, type of leukaemia and the fact that the leukaemia had not spread to his spinal fluid, Benji had a good chance of making a full recovery. We were all very relieved to hear he had the ‘best’ leukaemia. 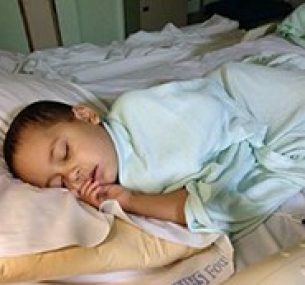 We were informed about Benji’s treatment plan which would take three years, the first six months being the most intense. 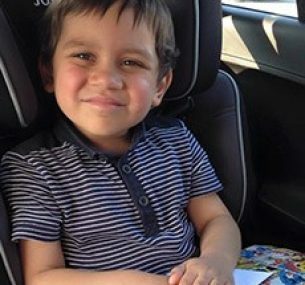 Within two months of Benji being diagnosed an MRD test showed that he was in remission! This was the most amazing news and we all cried with happiness! Benji was responding so well to the treatment, and was proving to us just how strong and resilient he was. We were all so proud. Leukaemia is a horrible disease that likes to come back after you enter remission. Because of this, treatment has to continue for a long time. The aim when treating leukaemia is to get it under control as quickly as possible. The next four months were very intense and the side effects of the drugs meant that Benji lost the ability to walk. He was very weak and very tired. By the end of the first six months of treatment he had learnt to walk again. He was generally very well and managed to keep hold of his hair right up until the last week of intense treatment, at which point he was totally cancer free! Benji was now ready to move onto the two-and-a-half-year phase of long maintenance. This consists of a daily chemo, a weekly chemo, a monthly chemo and five days of steroids every month. The side effects of this phase are minimal so he can live a near to normal life. Benji recently returned to pre-school where he is enjoying some normality. He is looking forward to starting school in September and celebrating his first year in remission in October! Benji started school in September! He is absolutely loving it. He has learnt how to read and write. He is very eager to learn. For the first half term of school he had just one day off sick, so health-wise he is doing great. This half term has been full of winter bugs – he has had a few more days off and some trips to the hospital, but he is generally doing well. Last week he started something called ‘telephone maintenance’, which means he only has to be seen in clinic once a month, instead of weekly or fortnightly. He is continuing to have his daily chemo and other maintenance treatment. He has two years left of this. Life has become quite near to normal. Benji is enjoying his childhood again! He is enjoying doing ‘normal’ things, for example he is looking forward to spending a weekend in London next week which he used to do often before diagnosis. Since the last update which was December 2015, Benji has continued to do well. He is now in Year 1 at school. He’s incredibly bright and hardworking, and thoroughly enjoys going to school. He particularly enjoys science and reading. He has only been admitted to hospital once which was last summer (July 2016), when he had a line infection (in his portacath) and glandular fever. Other than that, he has been generally well. Obviously he has picked up a few bugs along the way but manages to fight them himself. Occasionally he becomes neutropenic and has his maintenance chemotherapy stopped to allow his body to recover. Side effects of treatment are minimal but Benji still lacks the strength his peers have in school. He tries so hard to keep up with everyone and pushes his body to work the best it’s can! Benji is starting Capoeira classes this week with the hope it will help build strength up in his legs now he is coming to the end of treatment. 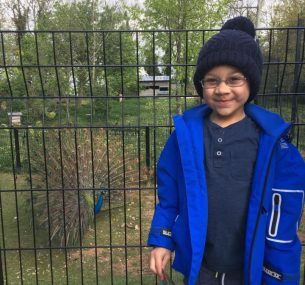 Out of school, Benji enjoys being outside and has a keen interest in wildlife. He enjoys travelling to London to visit his auntie and also loves spending time with his cousin. He also enjoys playing on his Xbox on days where he lacks energy. Benji also loves to collect Lego and enjoys visiting Legoland for his holidays as he isn’t able to travel abroad whilst on treatment. Benji will have his last intravenous chemotherapy and steroids in October 2017 and his last oral chemotherapy on 20 November 2017, which will mark the end of his treatment! Obviously we are very excited about this but somewhat nervous. As much as we are ready for treatment to finish, it will feel like we have lost our safety net, but we are confident that Benji will continue to live a happy and healthy life. Benji is very excited to have his last chemo and is looking forward to having lots of overdue adventures in 2018 when he hopes he will be able to go on a plane to Lapland and a summer holiday with all his family to Italy!